Apish Tshetsha is driving his lime green van with surf board attached to the roof, weaving his way down the main street in the Masiphumelele (Masi) township in central Cape Town. It’s Freedom Day, celebrations are taking place and the community is a hive of activity. The softly spoken 26-year-old comes to life as he drives through the community, his van stopping every five or so meters as a young member of the community greets Apish. ‘Awe!’ he shouts to his friends and community members. After minutes in his company, you sense that to Apish, sport is life. 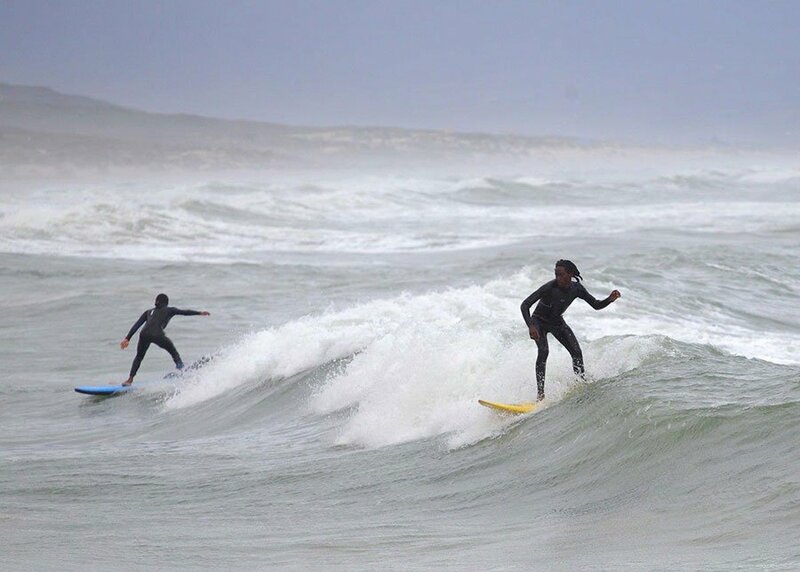 He waxes lyrical about the soccer teams he supports and his Springbok heroes, but much of his time is taken up by his newfound love of surfing. Three years ago, Apish couldn’t swim. “I can do a few lengths of the pool now,” he laughs. Through the Laureus YES (Youth Empowerment through Sport) programme, Apish was introduced to an award winning social entrepreneur called Tim Conibear, who was trialling a programme called Waves for Change, using the sport of surfing to help stabilise young people affected by emotional and psychological trauma. Tim introduced Apish to surfing and the 24-year-old has not looked back since. He completed his youth care worker training and progressed through the Laureus YES programme, learning a variety of life and social skills along the way, as well as developing his confidence as a public speaker. Drugs, peer pressure, gangs and staying away from the wrong crowds. Apish highlights the struggles he faced as a youngster. Apish used his hard work on the soccer field to keep a focus in his life and help himself concentrate on his studies, keeping himself away from falling into the wrong crowds. “I would spend my whole day playing sport and at night I would be with the books studying, so sport and education have made me who I am, even in my values as well. You don’t want to disappoint your elders, your family and to the young people as well because role models are so, so rare in the township, especially for young people. To say the 24-year-old is a role model would be an understatement. Apish has introduced the sport of surfing to the soccer-loving youngsters living in Masi. 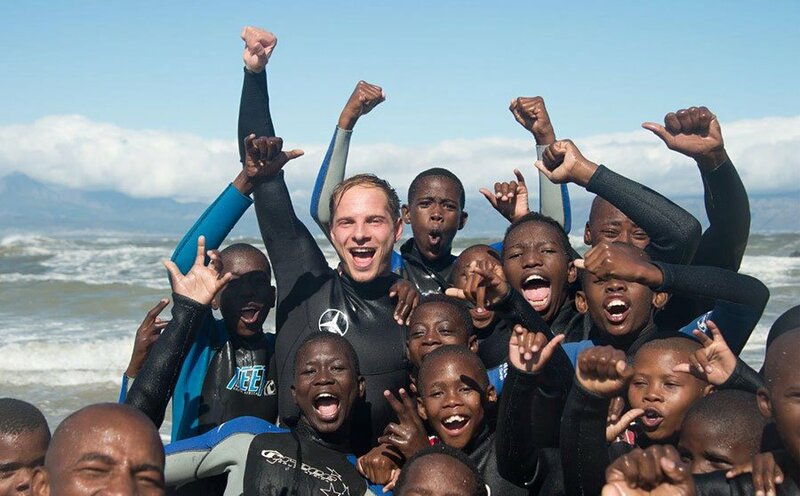 Through the Waves for Change programme, surfing is a sport of the community today. The Laureus YES programme empowers young people from community sports organisations to become the future leaders of the sport for good movement. Through the YES programme, young people are given the information and tools to take back to their communities and pass on. Judging by the youngsters of Masi, many of them are already thanking Apish Tshetsha. Through sport, Apish was given a chance and an opportunity to pave his own path, one which he grabbed with both hands. When asked if he has one message for the youngsters in his community and other communities around the world, Apish doesn’t hesitate. Laureus Ambassador and world leading big-wave surfer Sebastian Steudtner paid an impromptu visit to meet Apish and the Waves for Change youngsters, and was blown away by the activities which were taking place. 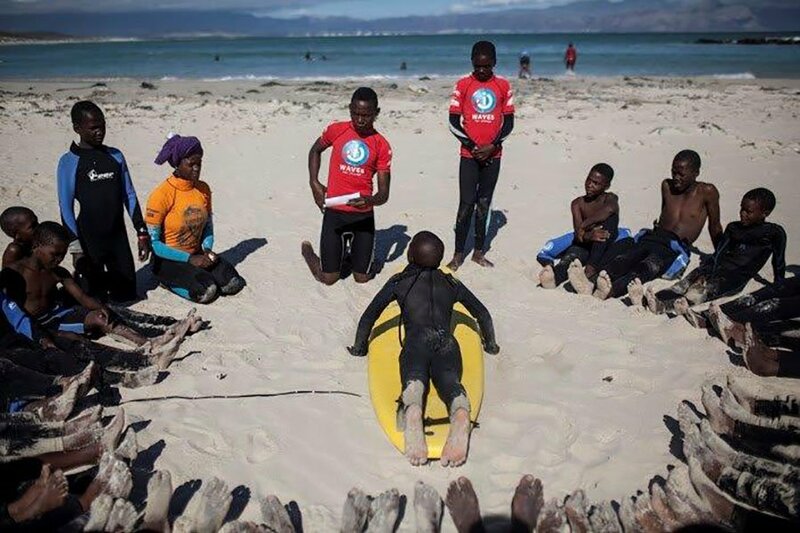 Created by the pioneering Isiqalo Foundation, the only organisation in the world looking to harness the power of surfing to address the issue of HIV awareness, Waves for Change is based in the informal settlement of Masiphumelele in Cape Town. The project aims to encourage young people to know their HIV status and to produce community peer leaders that will encourage a responsible and informed approach to the issues surrounding the spread of the virus. Laureus Sport for Good South Africa supports 16 projects across the country and since its inception in October 2002 has raised over R50 million (2,9 Mio. EUR) for projects which have helped to improve the lives of over 90,000 young people up until 2016.